Samsung has just announced it has expanded its Pay mobile payments service with a brand new feature that offers users a percentage of their purchase price back. The catch is the new option is only available when buying stuff from select retailers, so you'll have to identify those before placing your order. The new feature is pretty easy to use, as you'll find a new Cash Back section in the Samsung Pay app's home screen. From there, you should find a range of exclusive offers from all retailers that support the new Cash Back feature. As soon as you tap on one of the offers in the Cash Back section and finish the purchase via the participating merchant, you'll receive a percentage back on your purchase, which you'll be able to spend toward a purchase anywhere Samsung Pay is available. 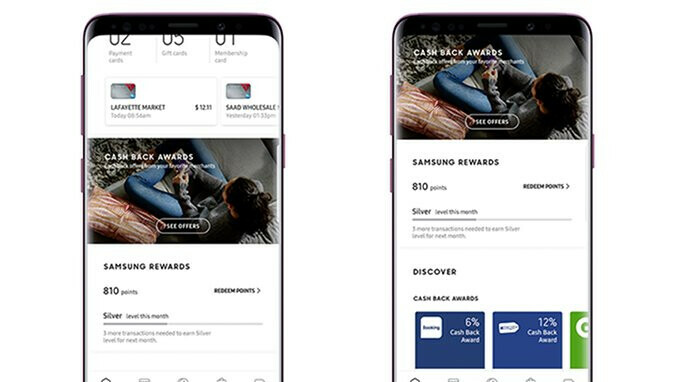 In the same piece of news, Samsung announced that beginning later this month, customers will be able to purchase Samsung Rewards points, which can be used to buy other products and use them to reduce the price of their future purchases. One of the best payment system. Agreed, love to see the bartender's faces when they claim to not accept tap and I argue it will work, she gives me the POS terminal, I tap on the swipe slot with my S8, and it WORKS!!!!! The only thing that I'm not used to is signing the receipt which is not very common in Canada as nearly all of the debit and credit cards have tap embedded and 80-90% of retailers accept tap. Same happens with me when I go to any restaurant any pay with Samsung Pay. Anyone that has a compatible phone and doesn’t use Samsung Pay is nuts, Samsung Pay has like the best rewards and incentives to use their payment method.